I have been creating meals to freeze because winter is definitely making it’s way here and with cold chilly days comes painful achy backaches. There are many days I don’t feel like standing and cooking so having premade foods helps me a lot. I prefer to freeze what I can in individual size mason jars because they store well in my freezer and I can pretty much see what’s in them as well. 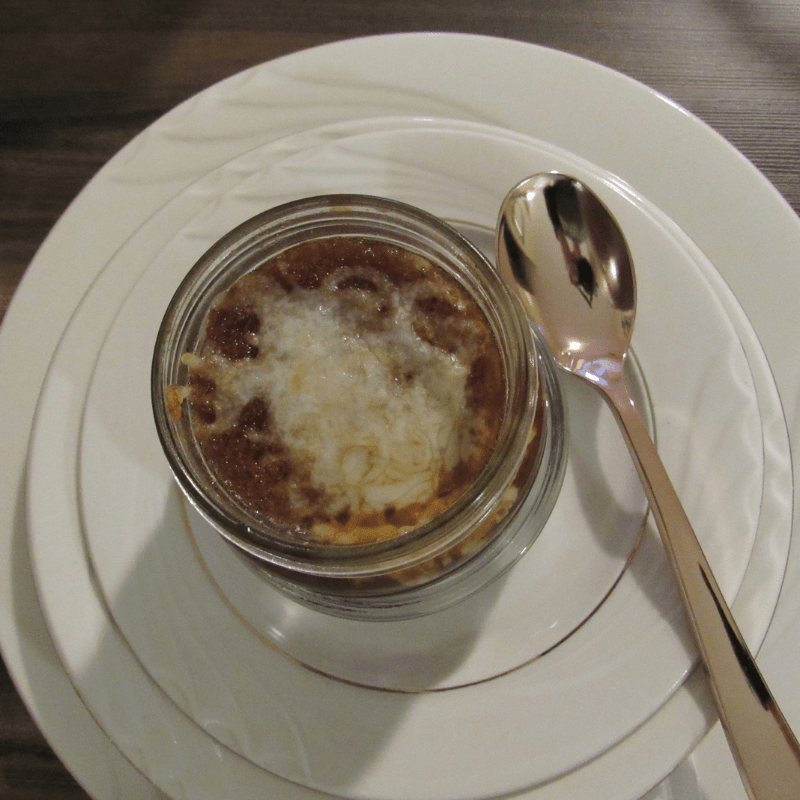 The food taste as good as it does fresh made when stored in jars, IMO. 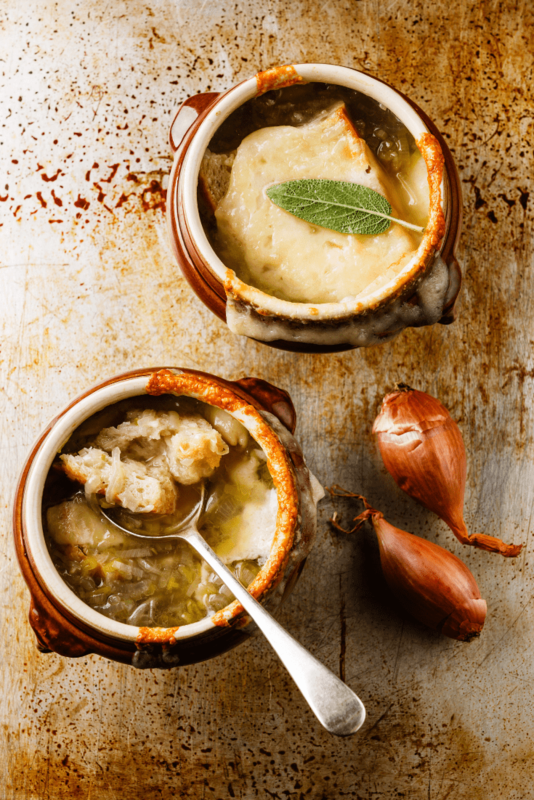 If you want to try the best French onion soup recipe you will ever use, grab your apron and let’s get started. A couple things to note before we start. Don’t use red onions, sweet and yellow onions are perfect. 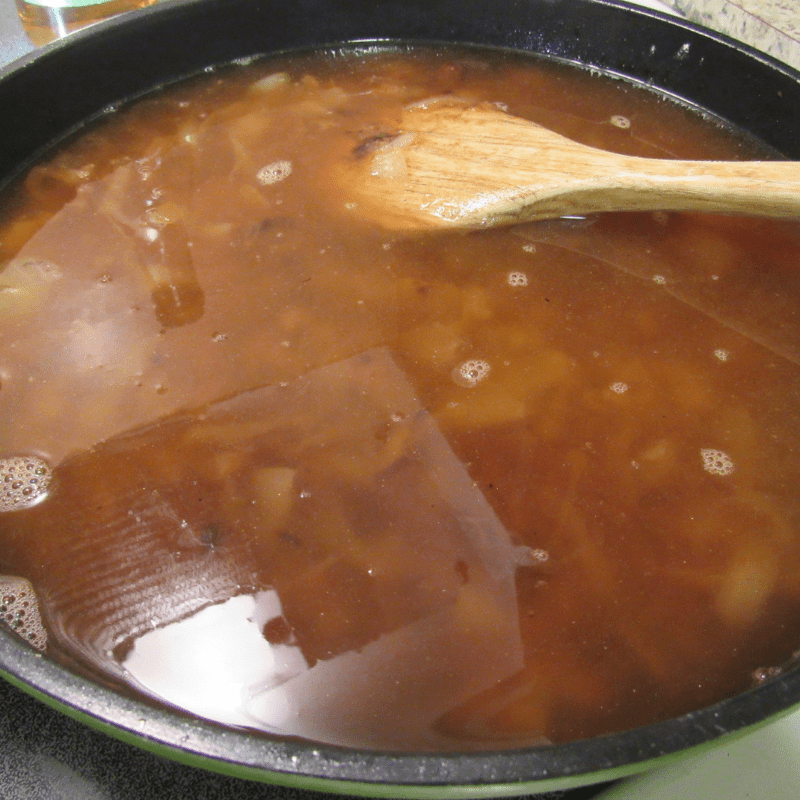 Red onions will give your soup a dingy gray outcome versus a pretty brown soup with sweet and yellow onions. The other thing I want to note is that you need to add both the olive oil and the butter to the frying pan when cooking your onions. The oil keeps the butter from burning. 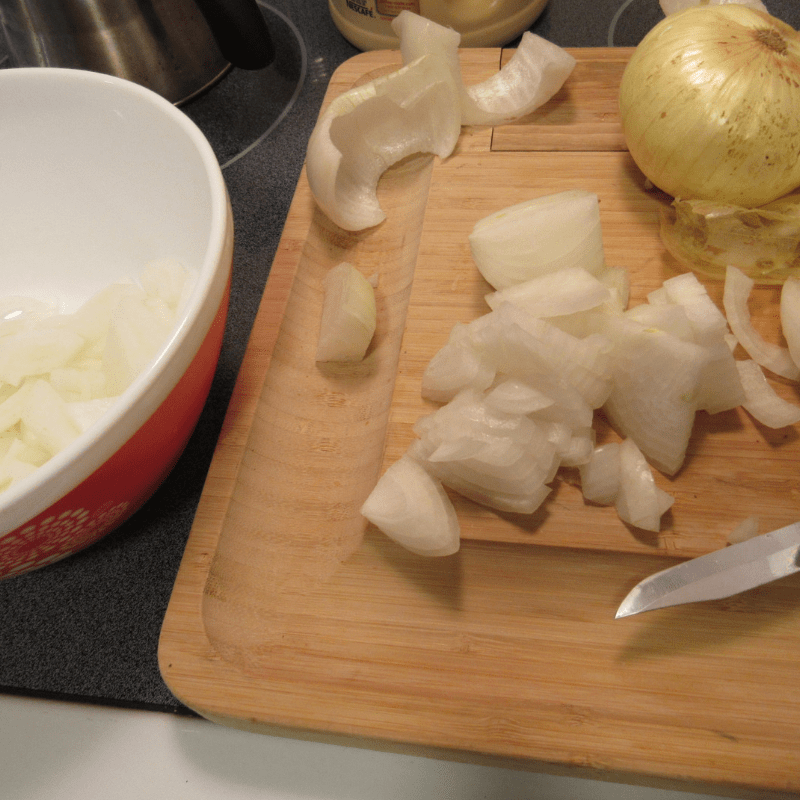 For 5 small mason jar sizes of soup, use 5 large sweet onions. 1 carton of chicken stock. I use Swanson’s but I’m sure any kind you have will be fine. 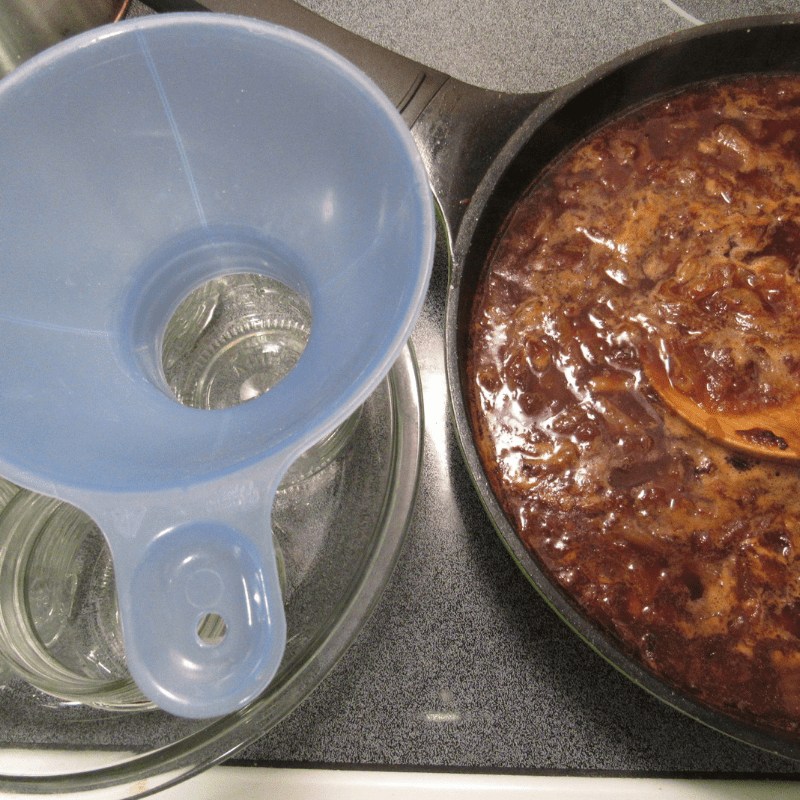 1/2 cup of cooking sherry. Salt as desired (I use 1 teaspoon). Pepper as desired (I use 1/2 teaspoon). Toast or toasted french bread slices. And that’s it. This recipe does not call for a lot of recipes which is great because it helps to memorize how to make it. 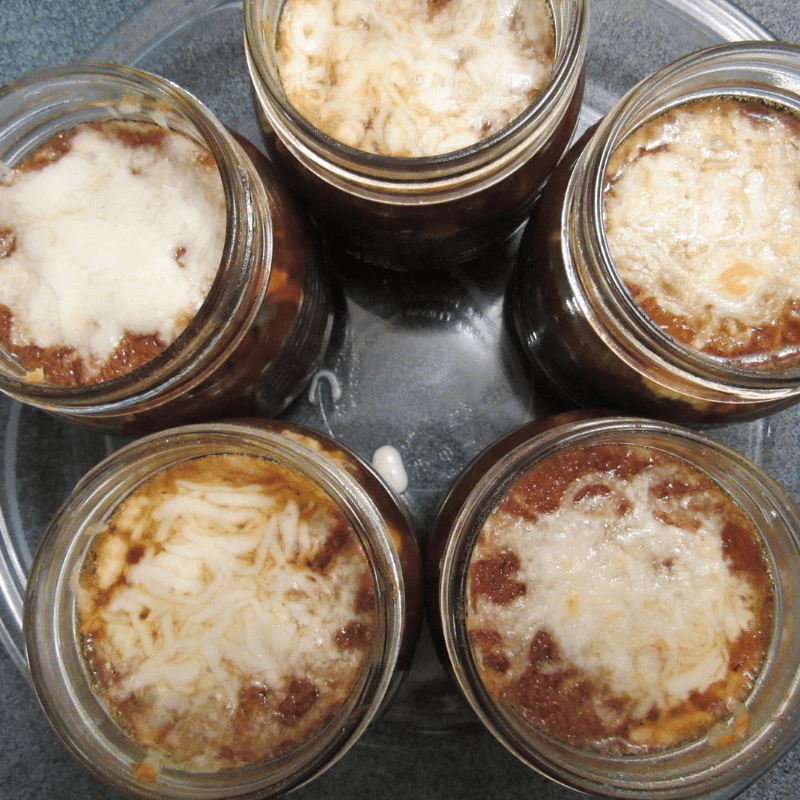 If you love French onion soup as much as I do, it’s sure to be a crowd pleaser. Cut and slice your onions. I cut my onions in half, then in half again, then slice. 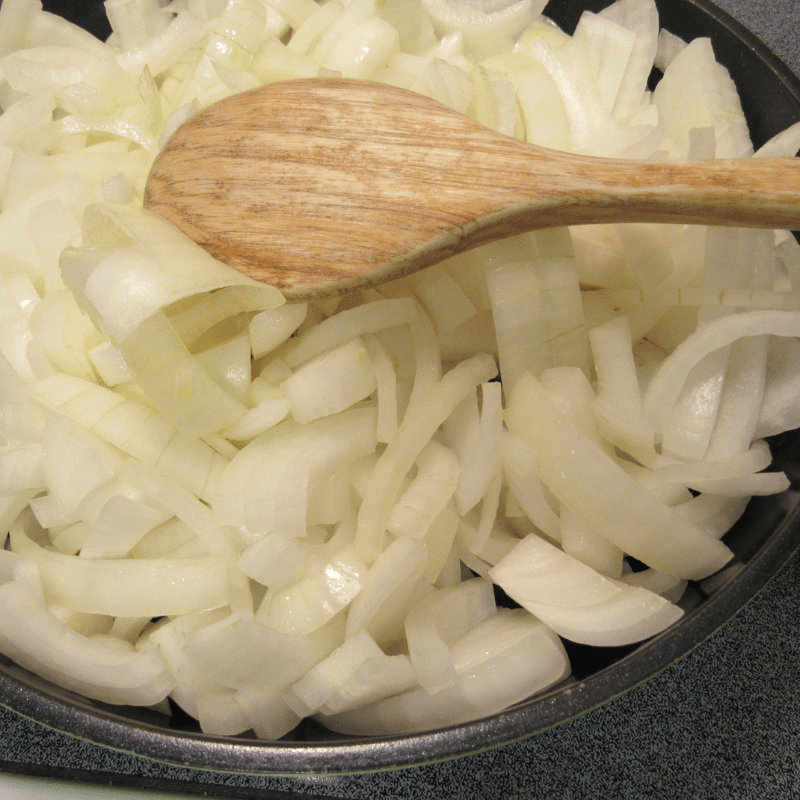 There’s no right or wrong way to slice your onions. They’re going to cook down anyway, really small. Turn stove top burner on medium-low. 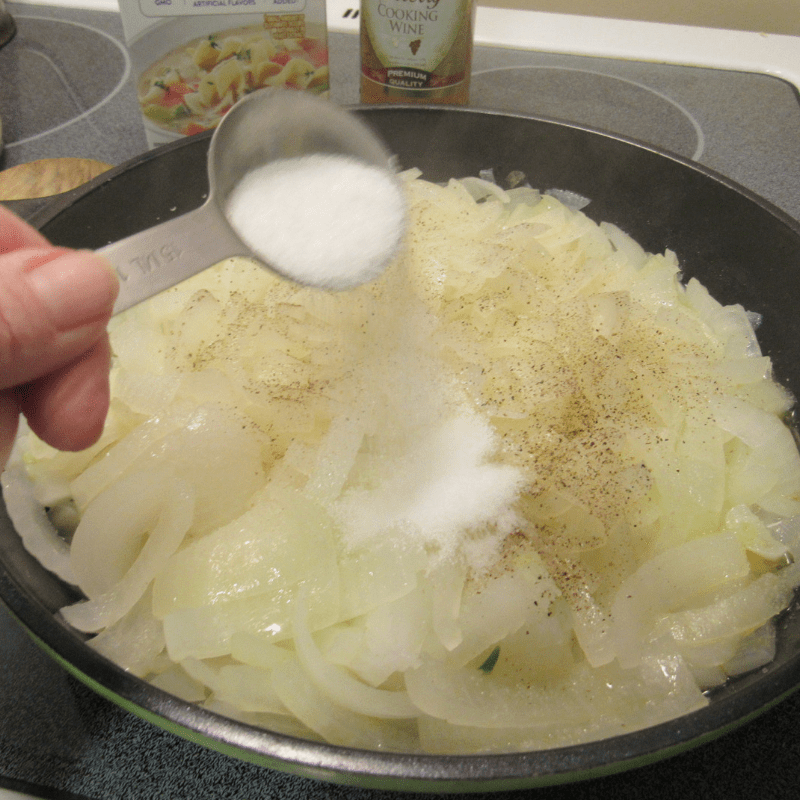 After cutting my onions, I add 1 1/2 Tablespoons of olive oil in my dutch oven or frying pan, whichever one I choose to use, and then I add a big dollop of butter to that. I’d say it’s a nice sized Tablespoon. 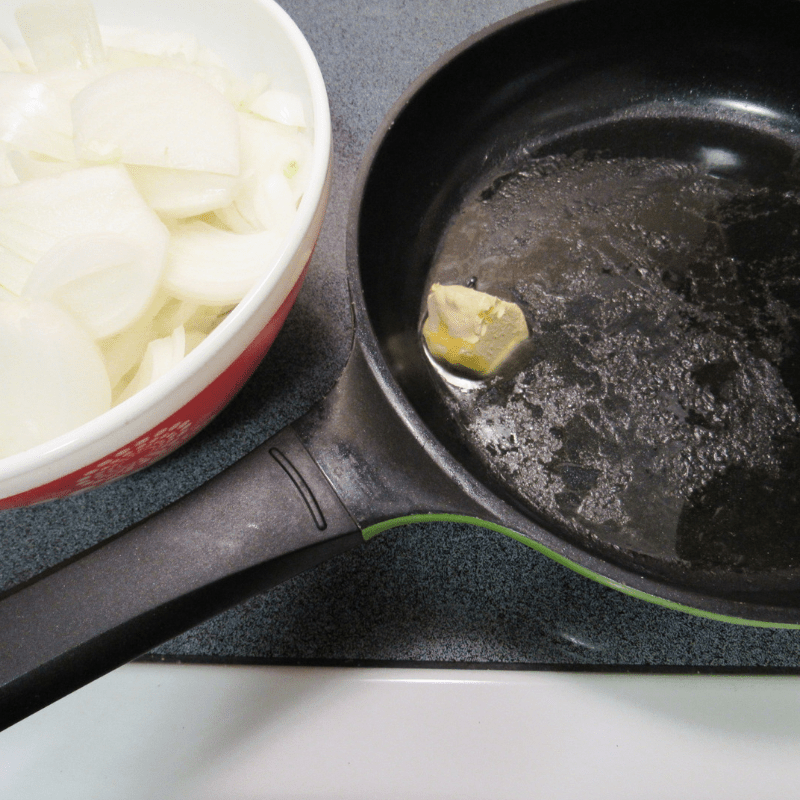 When the butter is melted, add all of the onions in your pan. Then coat all of the onions with the olive oil and the butter. Just keep stirring until it’s all coated. Cover your pan, and cook until the onions are translucent. This generally takes about 20 minutes when I use my frying pan. 15 or so with a dutch oven. Uncover, stir, add salt, pepper, and sugar. 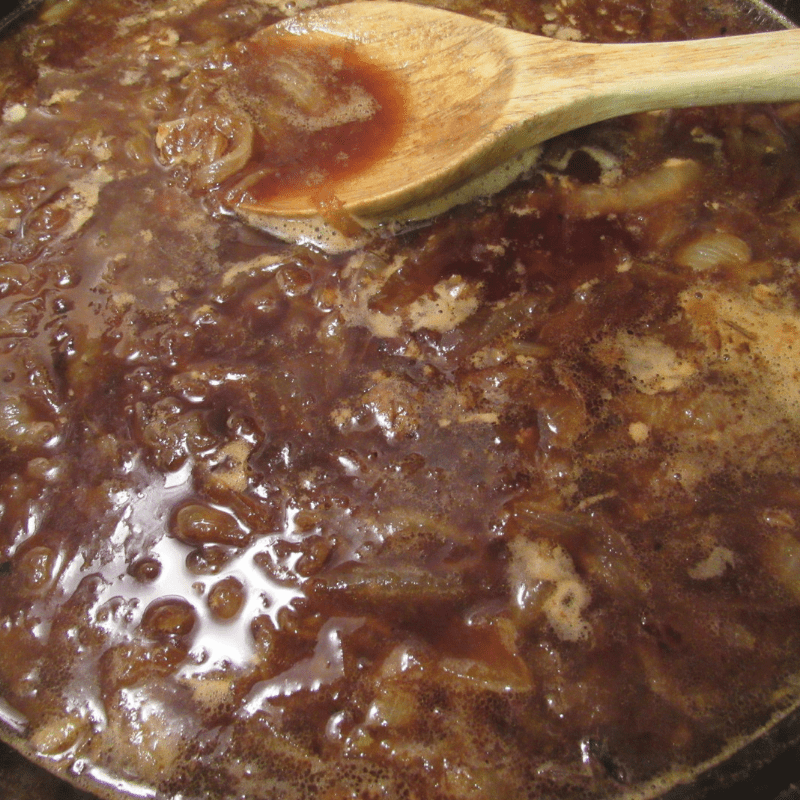 Don’t omit the sugar because the sugar is what helps caramelize the onions to give them that pretty brown color. Cook about 40 minutes on medium-low, stirring every 5 minutes (so the onions don’t stick and burn, and trust me, they will if you don’t stir). 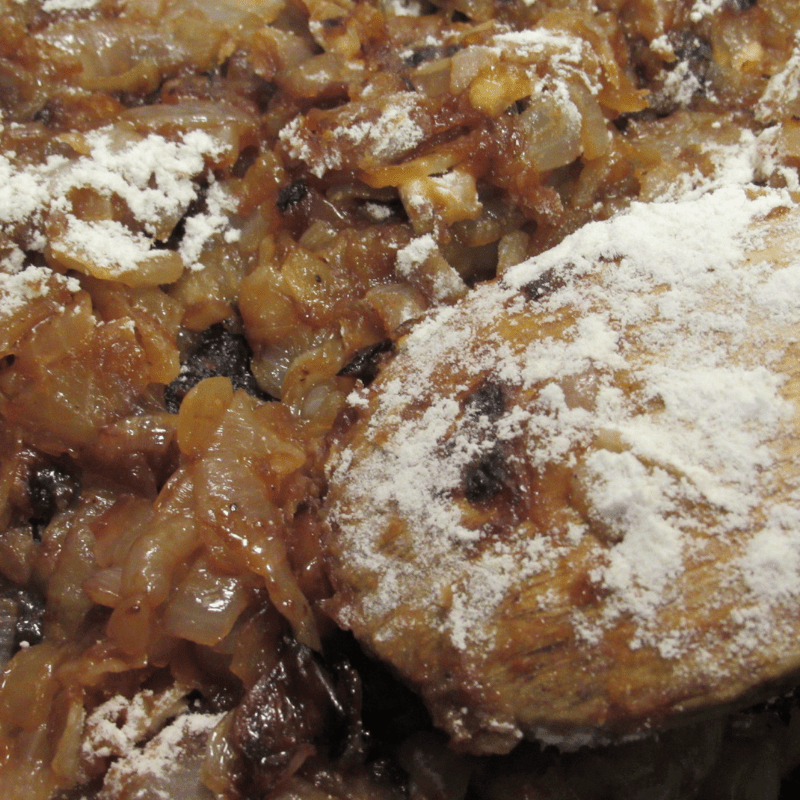 Once your onions reach your desired color add the flour and stir until coated. Then stir and cook an additional 5 minutes. I stir constantly or mine tend to stick at this point. 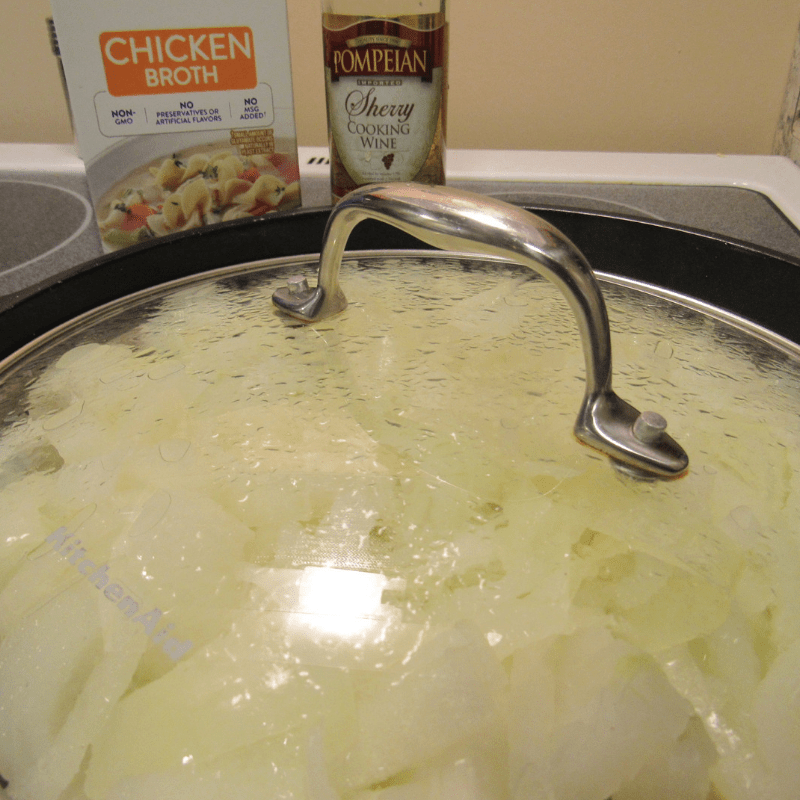 Now add the chicken stock and cooking Pompeian cooking sherry. Leave uncovered, and cook, for about 40 minutes, this really depends on how high you have your heat and the desired thickness you’re seeking. When it’s ready and has that pretty brown brothy look, add to ovenproof bowls or mason jars if you’re going to freeze it. 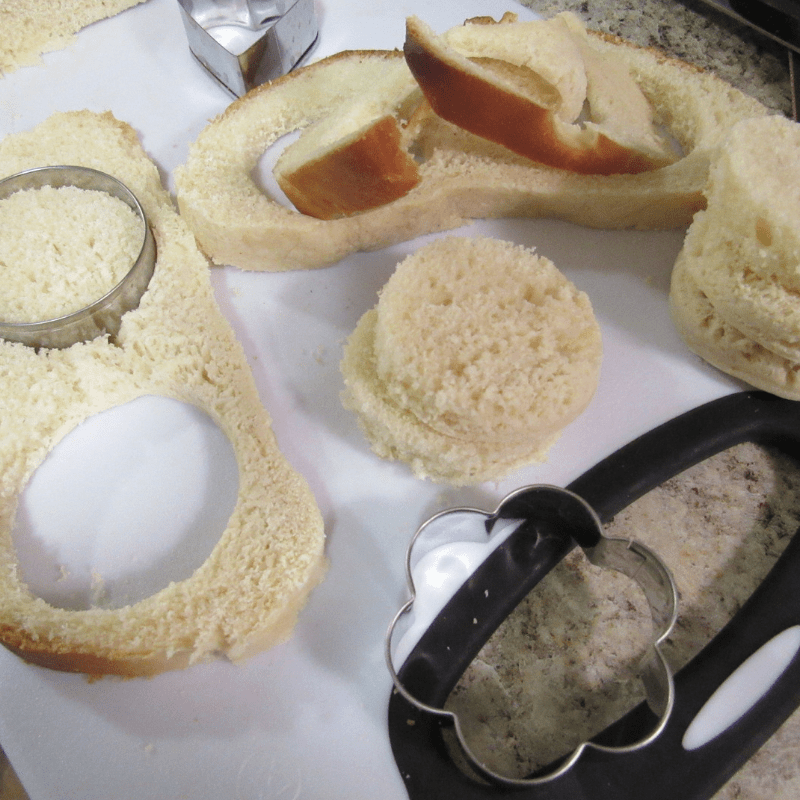 Lightly toast bread rounds or french bread slices. 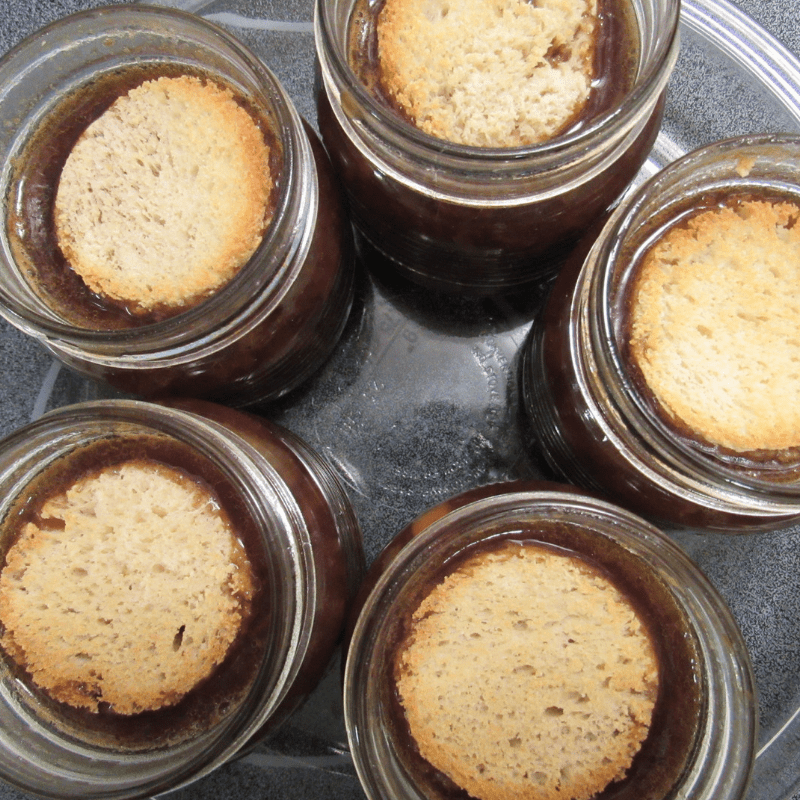 Add toasted bread or french bread to the top. Then top that with cheese. 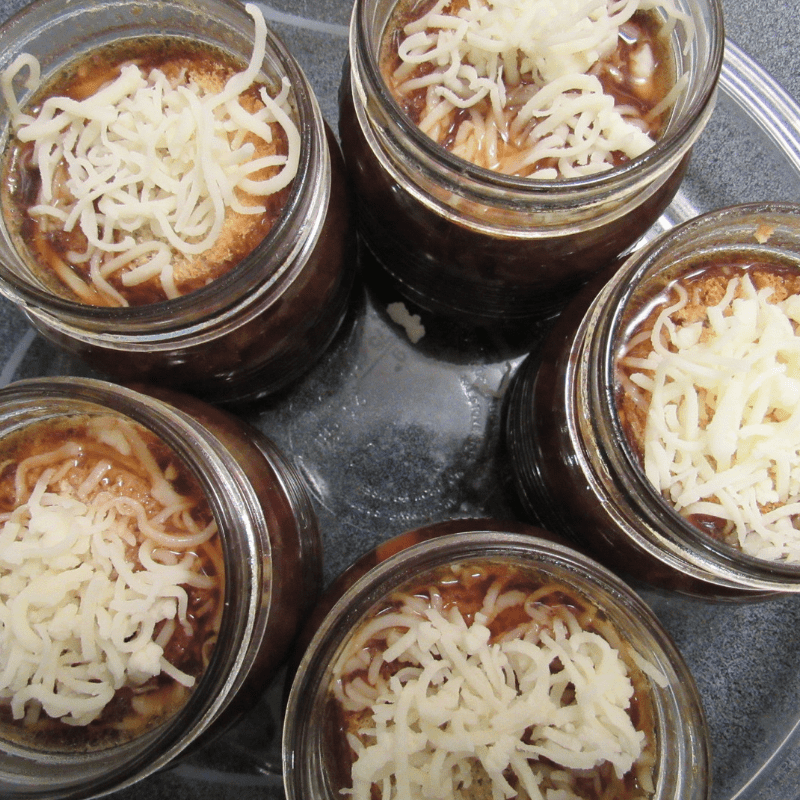 Pop in the oven until cheese is melted. Of course, you’ll want to double my recipe if you have a large family who enjoys seconds. I live alone so this provides me with a helping to eat when it’s done and 4 jars to freeze for later. Apartment 8A © 2018 & Beyond Terri Ramsey Beavers.